With the rugged yet refined patina of weathered metal, NexaHDP is the metallic inspired, color body glazed porcelain tiles by Florida Tile. Urban and industrial in its feel, NexaHDP is perfectly in sync with current architectural trends and delivers striking design impact. The interplay of surface, color and a high-low effect top glaze application creates a distinctive metallic effect with a high degree of shade variation. Whether your design intent is industrial-edge or eco-chic, NexaHDP allows you to easily create stunning spaces using warm, varied hues of aged Copper; deep saturated Iron grays punctuated with layers of industrial rust; or the Sterling tones of old pewter and ash. Three large-format sizes: 12x24, 24x24 and 18x36 come with a flat punch and rectified edges that allow for tight, nearly seamless installations. A 3x12 bullnose, a modern 12x12 offset stack mesh-mounted mosaic and a unique 12x12 architectural 3D mosaic (for walls only) are offered in all three colors providing endless creative options. 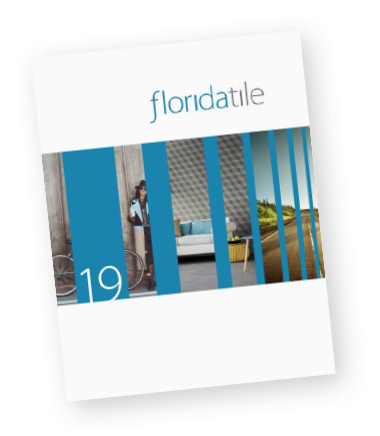 As part of Florida Tile’s newest innovation in product development, the NexaHDP collection incorporates Microban® antimicrobial technology, an amazing tool in the hands of architects and designers looking to develop exceptional environments with high performance in regards to hygiene and ease of maintenance. The eco-friendly Microban® treatment works continuously, inhibiting the growth of bacteria, improving visible cleanliness, and reducing odors for the life of the tile. Manufactured using proprietary HDP—High Definition Porcelain® printing technology, NexaHDP is appropriate for all applications in both residential and commercial settings. It is entirely made in the USA in our Green Squared® certified Advanced Manufacturing Center in Lawrenceburg, KY, of 40% pre-consumer recycled content, meets the DCOF AcuTest® requirements to be installed in wet areas and is GREENGUARD® and Porcelain Tile certified.